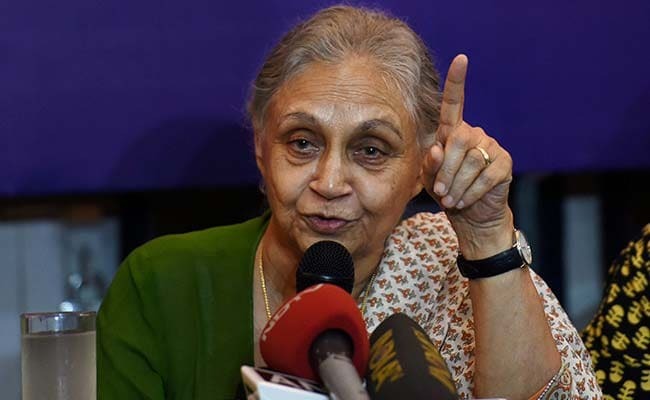 Former Chief Minister Sheila Dikshit took a swipe at her successor Arvind Kejriwal in Delhi, saying that the national capital had among the best bureaucrats in the country. But if you only wish to pick up battles of ego, you cannot even work under best of environments. NEW DELHI: Chief Minister Arvind Kejriwal says that 90 per cent of the city government's top bureaucrats, IAS officers, "do not work". His predecessor Sheila Dikshit, 79, disagrees. The three-time Chief Minister says Delhi has some of the best bureaucrats, a sharp rejoinder to Arvind Kejriwal, 49, who had just yesterday blamed Indian Administrative Service, or IAS officers for obstructing files of development works. "Kejriwalji, Delhi has some of the most efficient bureaucrats. They helped me tirelessly in achieving my goal of transforming Delhi," Ms Dikshit, who was the city's chief minister for 15 years from 1998 to 201,3 tweeted. In 2013, she had lost out to the short-lived AAP government. After a spell of central rule, AAP returned to power with a mega majority, mopping up 67 of the 70 assembly seats in Delhi. Ms Dikshit also took a clean swipe at the Chief Minister, saying the Atal Bihari Vajpayee government was at the centre between 1998 and 2004 "and I did not find excuses to deliver on the promises made to the people of Delhi". The context of the Chief Minister's harsh appraisal of the top bureaucracy was a continuing tug-of- war between the Aam Aadmi Party's city government and the Lieutenant Governor after the BJP-led central government watered down the elected government's powers. Mr Kejriwal's audience at Monday's event comprised junior employees and pensioners of the power department. He spoke about his efforts to give the government's contractual employees a permanent job but declared that the plan was blocked by the IAS officers. "They said if regularised they won't work. I said, if this is the logic then all the IAS officers should be ad-hoc because they do not work," the Chief Minister said. "90 per cent of them (IAS officers) do not work and hold up the files," he said. When someone pointed out to Ms Dikshit on Twitter that she didn't have to contend with a Lieutenant Governor who ordered bureaucrats not to show files to the CM, Ms Dikshit recalled that she also worked with the BJP government for some part of her 15 years as Chief Minister but did not find excuses. "If you only wish to pick up battles of ego, you cannot even work under best of environments," she added. AAP leaders have complained that the bureaucracy had been pressured by the NDA government at the centre through its Lt Governor to stall projects proposed by the elected government to paint them in a poor light in front of the electorate.